Jabsco of Santa Ana, Calif., has a new high-pressure Ultra 7.0 Washdown Pump designed to provide the highest pressure and flow rates for fast and easy cleaning of boats and docks. With the included 35-amp main breaker, this washdown system can be installed on almost any boat without the need for extensive rewiring, according to the company. The Ultra 7.0 is suitable for fresh or salt water, is self-priming up to 8 feet, and can be mounted above or below the water supply in a dry location. The pump runs dry and is designed with sealed motor housings, making it resistant to corrosion, said the company. 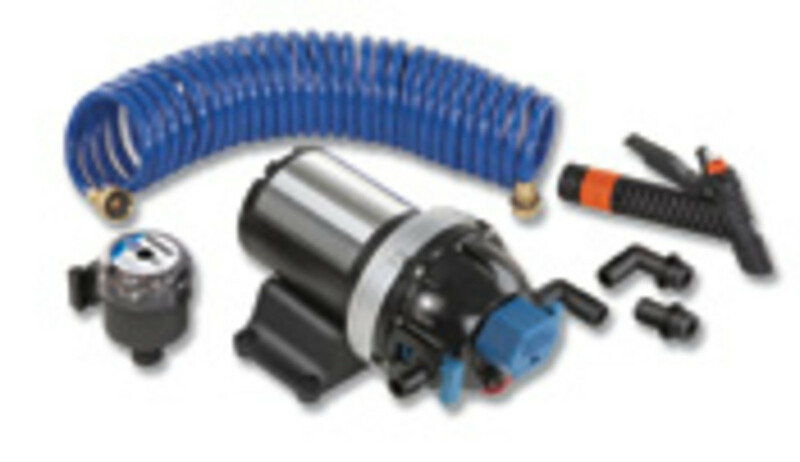 It also includes soft rubber mounts for vibration isolation, snap-fit port fittings for easy installation, and a Pumpgard intake strainer for reliability. The Ultra Washdown Pump is available in 12 and 24 VCD models, and is ISO 8846 and CE approved. The unit sells for $499.99, which includes a $70 main breaker. Visit www.jabsco.com.